Whilst all of our Travel Adventures Botswana vehicles come with Garmin SatNav, preloaded with Tracks for Africa, it pays to have a traditional paper map as back up or for a better overview of your itinerary. A full range of Veronica Roodt’s Shell maps are available from our office in Maun. Do not rely on any map 100% as it will not indicate if roads have been recently flooded for example. Follow us on Facebook and twitter for updates; we will also brief you during vehicle handover. Even the best navigators make mistakes, so ensure you travel with more fuel, food and water than you expect to use. The tracks in the parks can be quite technical and most are unmapped so try and remain on the more commonly used paths. If you get lost, retrace your tracks as soon as possible. There are a number of safari operators on most routes who would be willing to help but If you plan to follow an uncommon route please advise us during the briefing session. The Travel Adventures Botswana vehicles are equipped with navigation systems but Do not rely on them 100% as they do not indicate if roads have been flooded, for example. A respectful “Dumela” will usually have the locals smiling. Batswana are by nature very friendly people and will be more than willing to help you on your way or provide assistance. Please also be respectful and courteous to other tourists and users of our national parks, and follow the guidelines below. Do not drive into a wildlife sighting if there are other vehicles there first. Maintain a respectful distance until they move away. Do not drive off demarcated tracks. 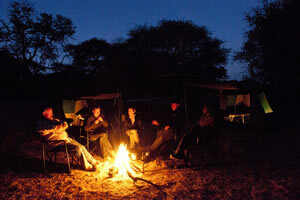 There are a number of private campsites in our reserves that are reserved exclusively for mobile safari operators. Please respect their privacy and do not drive into these campsites. Most lodges in our parks are not open to the public and cater solely to their own guests. Please respect their privacy. Botswana is generally very safe but petty theft is a growing problem in most towns. Always lock the vehicle and do not leave valuables like laptops and cameras in full view inside the vehicle. Avoid breeding herds of elephant. If they are moving ahead of you let them go, and whatever you do, don’t cut them off. The mothers are intensely protective of their young and will attack a vehicle without notice. The bulls more evenly-tempered but treat them with respect and keep a good distance from them. Ensure your food is securely locked at all times as hyenas and baboons think nothing of snatching your food from right under your nose. Animals do come into the sites at night; be careful of wandering around after dark and ensure you have a good quality torch. Please discard your litter in the facilities provided – or better still to the nearest town – and do not leave scraps lying around as it encourages scavengers. Animals do come into the sites at night. Do not walk in the bush without a qualified guide .You will be perfectly safe provided you abide by the National Parks & game reserves rules and regulations. 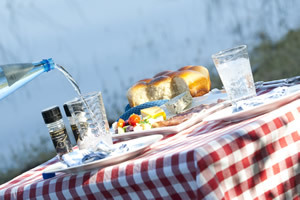 Most water supplies in the public campsites come either straight from the delta or from boreholes. The locals drink the water with no problem. We, however, suggest you boil it first or carry sufficient bottled water. There are numerous informal shop vendors in Botswana’s villages (even at Khwai) where you may buy dry goods and tinned food. The major centres such as Maun, Kasane, Ghanzi and Lethlakane have a number of suppliers who stock fresh vegetables, ice and fresh meat. 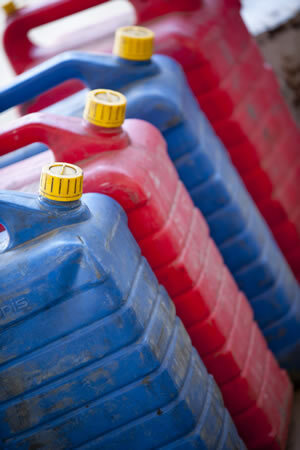 Smaller villages such as Nata have limited fresh supplies but will have fuel and basic supplies. Find out more about the region – and about driving conditions – before you arrive. The Bradt Safari Guide book by Chris McIntyre contains some excellent information, as do many of the other guidebooks on sale.